Rub all surfaces of roast(s) with seasoned pepper. Place pork in shallow roasting pan and roast in 350 degrees F. oven for 45 minutes to 1 hour and 15 minutes, until internal temperature (measured with a meat thermometer) reads 150-155 degrees F.
Remove from oven and allow roast to rest for 10 minutes. Wrap and refrigerate leftovers for up to three days. Use leftovers with Caesar Sandwich, Caribbean Pork and Mango Salad, or Mediterranean Pasta Salad. 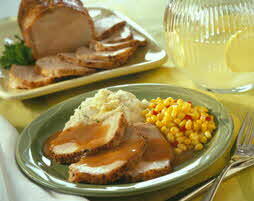 Complete this basic roast with garlic mashed potatoes with pork gravy and buttered corn.